Or view larger version. A woman contemplates a sign of the times urging lesbian unity. ca. 1972. Photographer unknown. Gelatin silver print. Collection of Oakland Museum of California. Lesbian communities thrived in Boston, Harlem, and San Francisco at various periods between the 1880s and the 1940s. But nothing matched the creative ferment of Northern California during the 1970s when lesbians - inspired by the rise of the nationwide feminist movement - created women-only cafes, bookstores, record companies, music festivals, fairs, community centers, dance and theater performances, political conferences, newspapers, and periodicals. 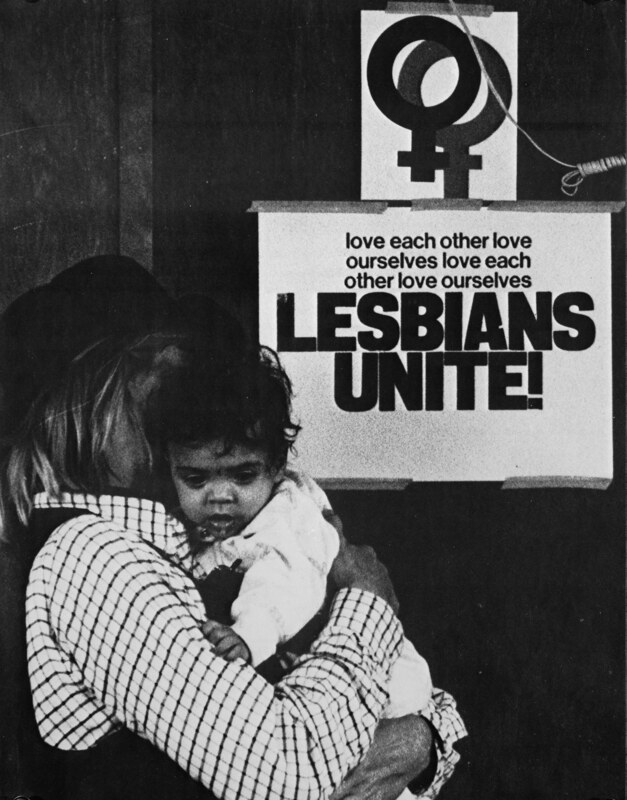 Declaring one of the era's political messages, the poster in this photograph urges lesbian unity. The lesbian agenda of the time focused on separating women's activities from men and forming a unified group to fight for political rights and social transformation. Activists argued that lesbians had more in common with heterosexual feminists fighting patriarchal and capitalist oppression then with gay men. The National Organization of Women (NOW) originally feared the lesbian activists, labeling them "the lavender menace." But in 1971, after vigorous debate, NOW passed a resolution that identified lesbians as "the frontline troops of the women's movement."